Hello all badminton enthusiasts. The dates for our 2019 Badminton Tournament will be September 19, 20 & 21 in Toronto. We will publish more details as and when they are finalized. 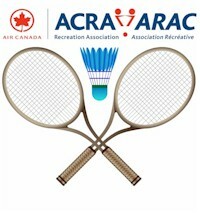 Website acrabadminton.org.uk will be updated soon. If you missed the photo ops in Prague, join us in Toronto in 2019 and get included. 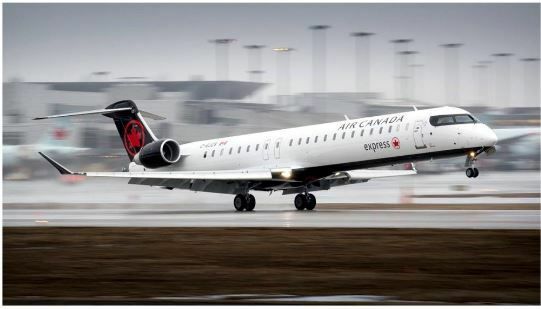 Air Canada January 14, 2019 announced an agreement to amend and extend our Capacity Purchase Agreement (CPA) with our Express carrier Jazz Aviation LP (a subsidiary of Chorus Aviation Inc.). The enhancements extend the CPA by 10 years from January 1, 2026 to December 31, 2035. The amendments are subject to approval of a tentative collective agreement between Jazz and the Air Line Pilots Association (ALPA), the union that represents Jazz pilots. They will also simplify and modernize Jazz’s fleet and give us additional regional fleet flexibility. Once the amendments are made, we’ll make an equity investment of $97.26 million in Chorus and Michael Rousseau, Deputy Chief Executive Officer and Chief Financial Officer, will be appointed to Chorus’ Board of Directors. On January 9, 2019 Air Canada published a press release announcing the completion of our acquisition of Aeroplan’s Loyalty Business, making Aimia Canada Inc. (ACI) a wholly owned subsidiary of Air Canada, along with Air Canada Vacations and Air Canada Rouge. In the release, Air Canada confirmed that Aeroplan Miles will be honoured on a one-to-one basis in our new loyalty program when it launches in 2020. Hi Folks, picked up what may be an early aviation button. It is a winged shield with ML/AC on it. Could this be the Montreal Light Aircraft Club? On Thursday, December 7, 2018 Pionairs and Partners in Scotland held their Christmas lunch at the Ellisland House Hotel in Ayr. The group of 23 assembled at 12:00 for 12:30. 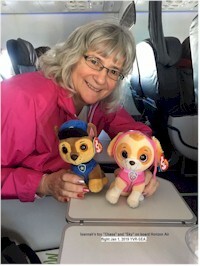 The committee of Avril Miller, retired Senior Passenger Agent at Prestwick, and Brian Flanagan, retired Duty Manager London Heathrow, were on parade to show everyone to their seats. Avril Miller welcomed Elisa and Mike Judkins our Pionairs UK Director and the other guests. Avril gave us a very humorous story of a recent bus journey from Ayr to Glasgow which gave us a good laugh. The hotel once again excelled themselves with a three course al a carte lunch and coffee which was superb. This was our second visit to the hotel which we used for our reunion last year. The winner of the raffle was John Gibson retired Aircraft Technician Prestwick and Glasgow. The afternoon was over all too quickly at 1700 with everyone looking forward to the next one. 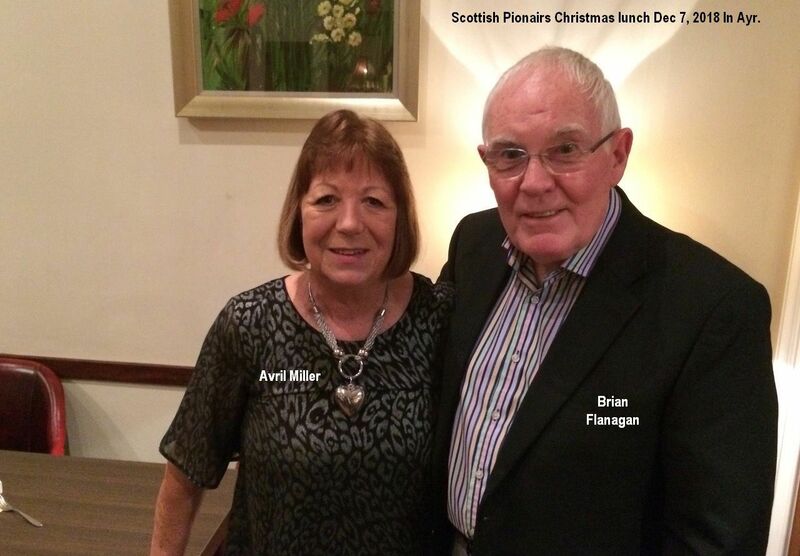 Our photo is of Avril Miller and Brian Flanagan. 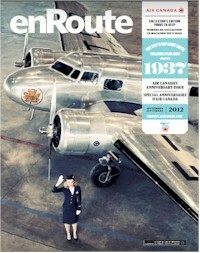 Here is the cover of the enRoute magazine for the 75th Anniversary. Gordon R. McGregor, born in Montreal, Quebec, graduated from McGill University in 1923 with a degree in Engineering. From 1923 until 1939 he worked for the Bell Telephone Company becoming Central District Manager. His flying career began at Kingston, Ontario in 1932 and the following year he gained his pilot's license at Ottawa. In 1936 he joined the Royal Canadian Air Force (RCAF) Reserve and obtained his RCAF wing in 1938 and was promoted to Flying Officer. His promotions were Flight Lieutenant (1940), Squadron Leader (1940), Wing Commander (1941) and Group Captain (1942). He was released from service on November 27, 1945. During the Battle of Britain, he flew Hurricanes in No. 401 Squadron RCAF, and was its top scoring pilot, being credited with five victories. 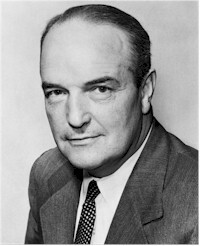 In 1946, he joined Trans-Canada Air Lines and later was named president serving until 1968. The Royal Canadian Air Force Association proudly offers civilian aerospace associations, commercial aviation companies and/or training schools the Opportunity to submit nominations for the Gordon R. McGregor Trophy on behalf of citizens, groups or units engaged in the provision of air transportation in Canada. Victoria B.C. seems a natural place to hold a Victoria Day parade. 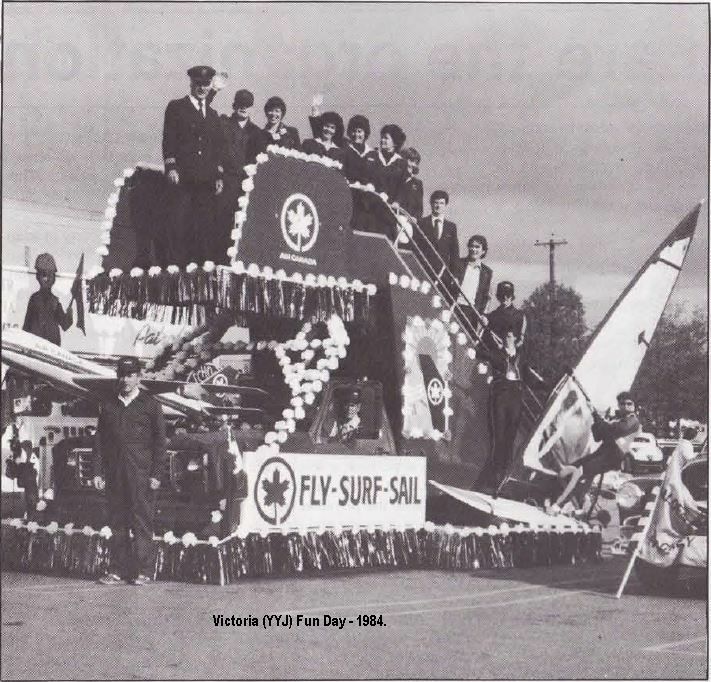 An Air Canada volunteer committee, consisting of Glen Hale, Lead Station Attendant; Bernie Stav, Station Attendant; Hans Brouwer, Millwright and Passenger Agents Rosemary Bradley and Lorna Philbrick designed a float, incorporating flying with the parade's theme of sailing. It proved to be a winning combination with the float earning top prize in its category. In the photo are: Hans Brouwer (in front), Glen Hale (driving), Chris Bradley (on windsurfer). On the passenger stand from the left: Gus DeJardin, Albert Van Wyk, Margaret Roethlisberger, Pat Young, Rosemary Bradley, Alice Little, Lorna Philbrick, Ivan Swedberg, John Caldwell, Bernie Stav and Sandra McRae, (daughter of Dale McRae). The executive of the Calgary Club consists of: Gord Sanders, Director; Evelyn Wise, Secretary; Ken Morrison, Treasurer; Bernie Kemp, Joyce Young, Barb McKenzie and Jean Ingrarn, Telephone Committee and Don McGregor, Sunshine. Without missing a beat or a check-in, the Los Angeles ticket counter moved to new and better quarters in the airport terminal building. The new counter, located closer to the boarding gate, more than doubles Air Canada's dedicated check-in facilities, provides expanded work areas and increases storage space. In the photo, Customer Service Agents, from the left: Don Carlson, Donna Matta, Bill Sullivan and Bob Lane carry out four-ninths of the move, carrying the first four letters of the overhead sign to the new location. The fifth annual Windsor Challenge Cup was held at the St. Clair College campus, and more than 2,300 participants met to enjoy the fun. A wide assortment of events had been planned, including 'leap and chute', 'rickshaw run', 'sac soccer' and a 'team marathon'. Established in 1980 with the assistance of the Ministry of Culture and Recreation and the Province of Ontario, the event is an opportunity for Windsor's corporate and organizational employees to get together and enjoy cultural and recreational activities. An enthusiastic group of Air Canada employees were among the 115 participating teams, and they made a very good showing, placing 40th overall. The team won third prize for a handmade banner incorporating the company logo and that of the bicentennial, this year's theme. Team members included: Passenger Agents Rick Ruston, Roli Sylvestre, Wayne Delorme, Nicole Zangari, Vicky Campbell and Birgit Hayward; Station Agents Benny Smith, Jack Roberts and Randy Fetterly; Station Attendants Dan Janisse and Muzzer Booze and Lead Station Attendant Dennis Walsh. Relatives and spouses also got involved in the team activities. Participants and spectators look forward to next year's Challenge Cup. Signs point the way. 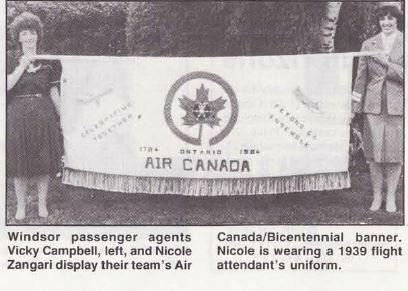 Windsor passenger agents Vicky Campbell, left, and Nicole Zangari display their team's Air Canada/Bicentennial banner. Nicole is wearing a 1939 flight attendant's uniform. Air Canada's and Canada's first female Certificated Avionics Technician on jet aircraft has maintained a low profile for the past year or so. 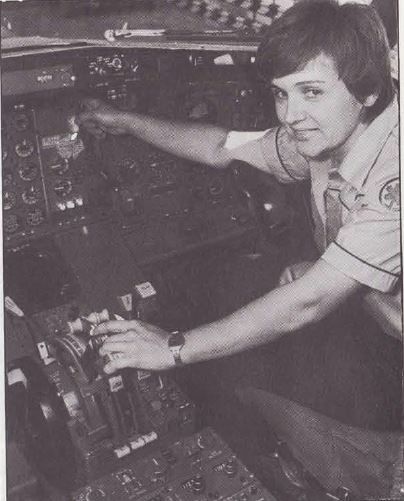 On days off and between shifts, Rachelle Boudreau has been hitting the textbooks studying for certificates on the B-727. Following six months of study, exams begin. The tests consist of a two-hour basic physics, two-hour basic electronics, two-hour electricity, three-hour air regulations, an eight-hour stint on the electrical system of the B-727 and a five-hour exam on the electronics system. The license enables her to sign for work that has been completed and a certificated avionics technician may also initial the work of others. The training program calls for a minimum of two licenses and a maximum of three so Rachelle may soon pull the books off the shelf again. For now it's the B-727 but who knows what comes next. Rachelle received her license on September 4, 1984 which also just happens to be her birthday. Rachelle is shown in the cockpit, a familiar milieu to her. It’s a significant step toward a future in which autonomous, electric “flying taxis” zip from skyscraper to skyscraper, bearing passengers and cargo in service of an entirely new form of urban mobility. 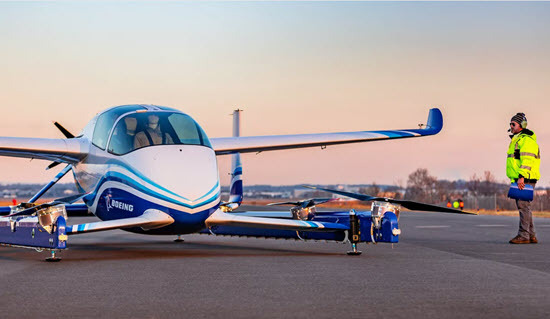 Boeing is just one of dozens of companies that are pursuing some form of urban air taxi service, but as one of the largest aviation companies in the world, clearly, it has the resources and the engineering prowess to get something in the air sooner than later. The following articles gleaned from the AC "Horizons" magazine September 1984. The Canadian Transport Commission has approved the purchase of Eastern Provincial Airways by CP Air which agreed in April to purchase the regional airline from Newfoundland Capital Corp. for $20 million. CP Air says it does not plan any changes in the operation of EPA. Alberta government reduces PWA stake. The Alberta government has reduced its stake in Pacific Western Airlines to just under four per cent. The province sold 1.35 million common shares of the airline at $10.50 each. After purchasing 99.9 per cent of PWA in 1974, the province began selling its shares last year. While the government has relinquished majority ownership, it has retained residual control of the airline by passing a law prohibiting any other party from owning more than four per cent of the voting stock. The government may own any amount. A total of three airlines plan to move into the cut-rate air fare. The market between Mirabel International Airport in Montreal and points in Florida, Atlantic City and Newark will soon see new airline service. Nordair has stated that it will commence twice weekly service between Mirabel and Fort Lauderdale, possibly by October. City Express has indicated that it will begin Dash 7 service within three months to Atlantic City and to Newark while Northeastern International Airways, based in Fort Lauderdale, says it will begin daily service to Mirabel and charge $100 one way. Airline slashes fare to compete. Nordair is slashing its regular fares by a third on scheduled flights between Ottawa, Toronto and Hamilton to meet the competition from upstart City Express. Nordair's new one-way fare is $69 on the Ottawa-Toronto and Ottawa-Hamilton routes, down from $103. Found in the "Info Canadi>n" magazine. A Toronto employee group was among the 200 corporate teams that participated in the second annual Skyline Club Corporate Run to benefit the Etobicocke General Hospital. The Canadian team consisted of Vanessa Bonner, Ken Wilson and Martin Williams of the Luggage Centre, Barry Exton of Cargo and Geri Laurence of Sales. 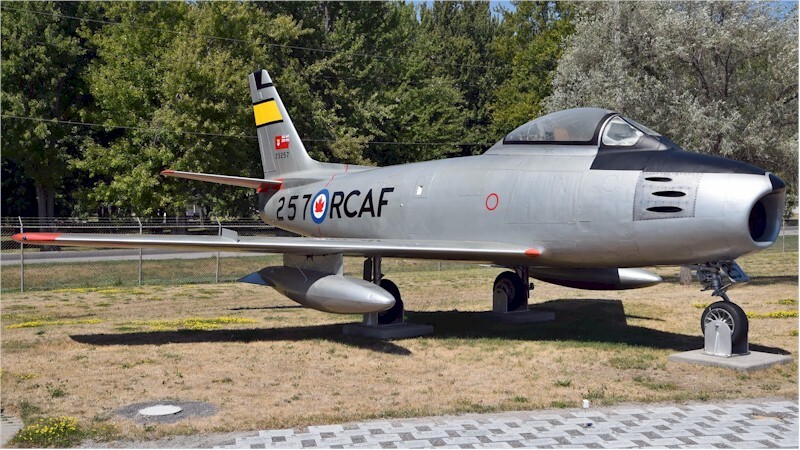 During my many YouTube hours (I live in Surrey B.C, I should go outside more), I came across the video below of a Canadair F-86 Sabre painted “RCAF Golden Hawks” livery. There is far too much available for me to paraphrase so following are several references if you are also interested in learning more on this fascinating group. 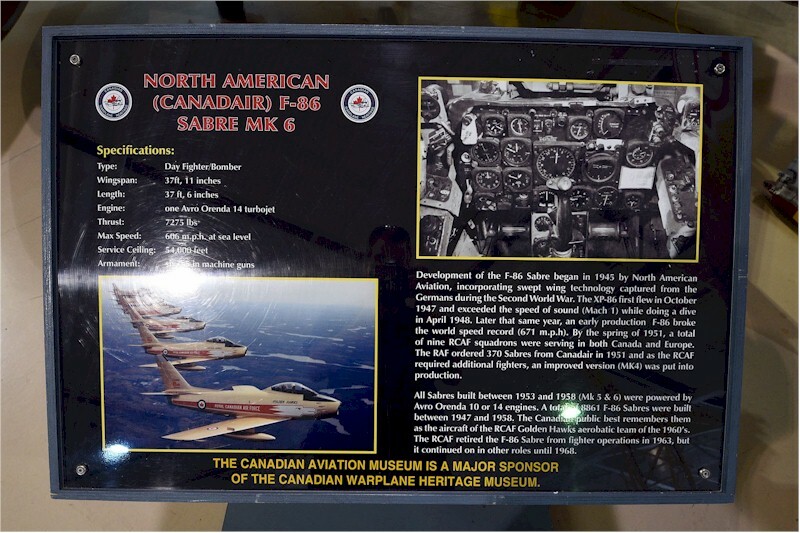 The Golden Hawks were a Canadian aerobatic flying team that was established in 1959 to celebrate the Royal Canadian Air Force's 35th anniversary and the "Golden" 50th anniversary of Canadian flight, which began with the AEA Silver Dart in 1909. 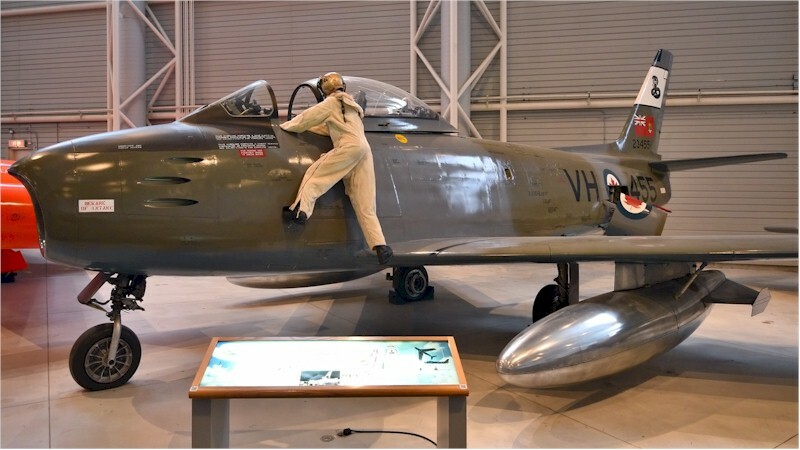 Initially, a six-plane team flying brilliantly-painted metallic-gold Canadair Sabre Mk.5s, was envisioned as performing for only one year, but the Golden Hawks were so popular after their single 63-show season that the team was expanded. In the following year, another plane was added to the team, allowing for a five-plane main formation with two solo jets. The Golden Hawks continued performing for three more seasons, changing to the Mk.6 in 1961, until they were disbanded on 7 February 1964, having flown a total of 317 shows across North America. For this NetLetter issue, I found the image for the heading image at Jetphotos.com and sent a request to photographer, Mirko Bleuer, for permission to use his photograph. Mr. Bleuer, who lives in Switzerland, generously gave us permission to use his photograph and sent along a few more images from his visit to Canada. I had a question about Canadian Pacific Airlines I hope you can answer. In article 1369, June 25, 2017, you mentioned that CPA re-branded to CP Air on June 17, 1968. I have philatelic first flight covers from September of 1968, that still have the old CPA Airlines cachets. Do you know the date the CPA switched their logos, etc? Its a long shot, I know. As mentioned, the new branding was announced in mid-1968 so it's unlikely it had much use until late in 1968. I recall they started repainting the DC-8s fairly quickly but there were still one or two in the old Canadian Pacific livery until as late as 1970. The first aircraft delivered from the factory in the new CP Air livery was the first of the original batch of seven Boeing 737-200s which were all delivered in late 1968 and early 1969. 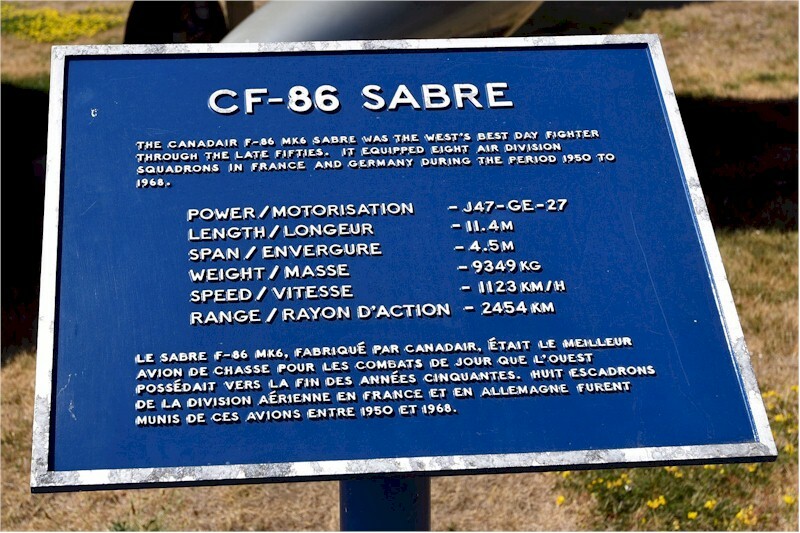 The first one, CF-CPB, was delivered October 21, 1968. I'm not positive but by then I think a few of the DC-8s had been repainted in the new orange CP Air livery. I believe the last DC-8 to be repainted may have been the last of the four factory-delivered DC-8-63s (CF-CPS) which was delivered in June 1968 in the old "goose" livery. But it was immediately leased for a year straight from the production line to U.S. charter carrier Flying Tiger and was used to carry U.S. troops to/from Vietnam (1968 the peak year of the Vietnam war with over half a million U.S. troops involved). That aircraft was returned to CP in July 1969. The 2nd last of the four DC-8-63s (CF-CPQ) was delivered in February 1968 and was also leased to Flying Tiger for six months from July to December 1968. While with Flying Tiger both those aircraft operated in the final basic pre-CP Air livery with only the name on the fuselage and the tail livery changed to Flying Tiger. This is what CF-CPS looked like during the Flying Tiger lease (registered N624FT). Not sure but I think the photo may have been taken at the Douglas plant in Long Beach, California just before delivery to Flying Tiger. This is the same aircraft at Amsterdam in August 1969, shortly after its return from the Flying Tiger lease, in its first month or so of CP service, named "Empress of Madrid" then. 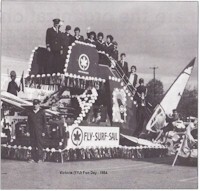 As mentioned in the caption, the font used for the Canadian Pacific name on the fuselage was non-standard. At the time of that photo I think most of the other DC-8s had already been repainted in the new CP Air livery. The July/August 1968 issue of the parent company, Canadian Pacific Ltd., newsletter ("Spanner") had details of the rebranding of all CP subsidiaries. It's interesting that all are now gone except for the original railway. cpair.blogspot.com/2007/04/cp-spanner-newsletter-july-1968.html. Click each page to enlarge. Before the end of the year, the symbol will begin appearing on rail equipment, planes, ships and trucks. You will start seeing it in stationery, print material, advertising and sales literature. For the remainder of 1968, the emphasis will be on equipment - trains, trucks, aircraft and ships - but the new system will not go into effect until refinements have been made by the management liaison group. For the major areas of application, painting of prototypes will begin shortly. In the Timetable Archive in right hand column note the last timetable using the old "Canadian Pacific Airlines" branding was the issue effective October 27, 1968 to March 31, 1969. 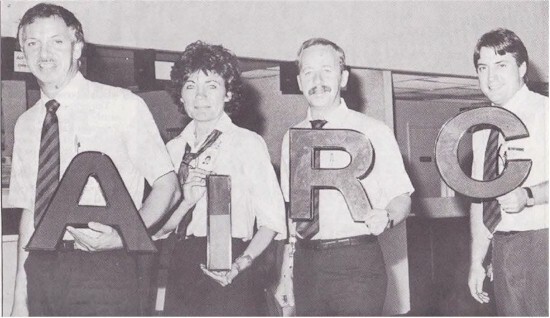 The first timetable using the new CP Air branding was effective April 1, 1969. That's about the best I can do. 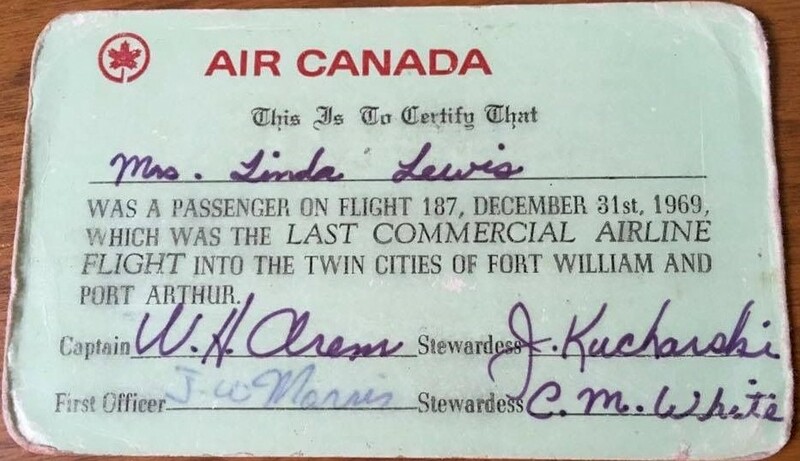 I expect there may be a few other CP veterans who were there before me (I joined CP Air in October 1969) who might have other relevant information. About time she was recognized! I was living in CYYL/Lynn Lake, MB from 1970 thru’ 1976. Probably mid-way through that period Ms. Bjornson set a time record for a Transair scheduled evening flight from CYWG to CYYL. Can’t remember the exact time; but I think it was in an F-28. I think the distance was 450 miles. Thank you for including the story of Jack Johnson’s Curtiss Jenny in Netletter #1405. I am happy to report that contributions now exceed $8,000.00, so this project is fully funded. However, our very capable Curator, Dr. Lech Lebiedowski, has similar dioramas planned for several other historic aircraft, so funding for our aircraft displays is an ongoing need. Every museum needs revenues over and above admission fees, so tax-deductible donations would be very much appreciated. We occupy a 84,000 sq. ft. BCATP hangar adjacent to the now closed City Centre Airport in downtown Edmonton. Guaranteed that you would find a visit most enjoyable. In the U.S., air traffic controllers are working without pay while the President holds out for money to construct a wall across the southern border. 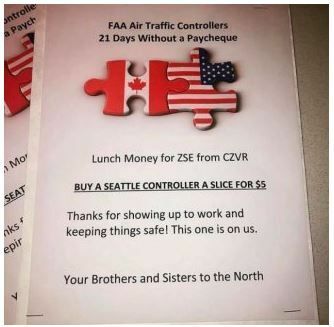 Meanwhile, on the nation’s northern border, Canadian air traffic controllers are demonstrating what it means to be good neighbors. Air traffic controllers in New Brunswick and Newfoundland sent 32 pies to their counterparts in Ronkonkoma, N.Y., on Friday — the evening before the federal government shutdown became the longest in U.S. history. The government went into partial paralysis December 22. Canadian controllers from the east to west coasts have been sending pizzas to their American colleagues. 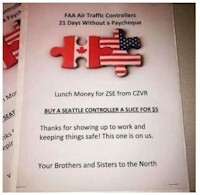 Airport workers at Montreal-Pierre Elliott Trudeau International Airport in Montreal have reportedly fed unpaid employees at LaGuardia airport while their Canadian colleagues in Vancouver have phoned in deliveries to air traffic controllers in Seattle. New rules for operating a drone. Transport Canada, on January 9, announced new rules governing the use of small unmanned aircraft, or drones, that introduce basic and advanced categories of drone operations, both requiring owners to register their aircraft and obtain a pilot certificate. Nationair 1984 - New airline established. Former employees of Quebecair, Nordair and Air Canada have formed a new airline, 'Nationair', headquartered in Quebec City. Operations are expected to commence on December 19, 1984 with two DC-8 aircraft in 252 seat configuration serving southern destinations from Montreal during the winter season and Europe in the spring and summer months. The director of flight operations and the chief pilot are both former employees of Air Canada. Andre Lizotte, former President of Nordair Ltd., has been appointed Chairman of the Board for Nationair, a new Canadian international charter carrier. Andre St. Denis, formerly Air Canada's treasurer and a Nordair director, has been appointed to Nationair's Board. Imperial Airways D.H. "Hercules" City of Karachi, arriving at Capetown on December 21, 1931 with the special Christmas air mail direct from England. The mail left Croydon on December 9, 1931. Heathrow wants to add 25,000 flights a year ahead of third runway. London’s Heathrow Airport has opened an eight-week consultation on its planned expansion that includes a proposal to add up to 25,000 additional flights a year through more efficient use of its two existing runways, ahead of the opening of a third in 2026. 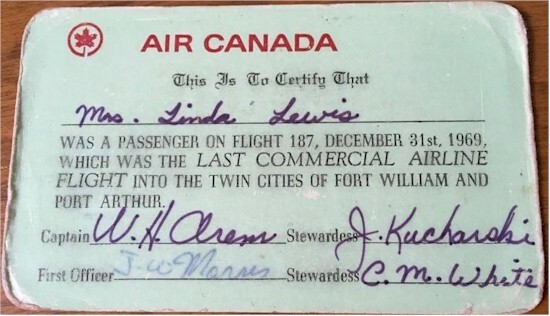 A photo of a certificate issued by Air Canada to Mrs. Linda Lewis confirming that Linda was a passenger on flight 187, December 31, 1969 which was the last commercial airline flight into the twin cities of Fort William and Port Arthur before they merged into the new city of Thunder Bay effective January 1, 1970. The noted captain was W.H. 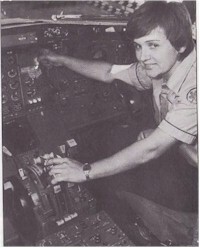 Arem, First Officer J.W. Moanes, stewardesses J. Kucharski and C.M. White. Update on carry-on bags and Zone 6. We recently trialed a number of initiatives to ensure our customers have space on board for their carry-on items. 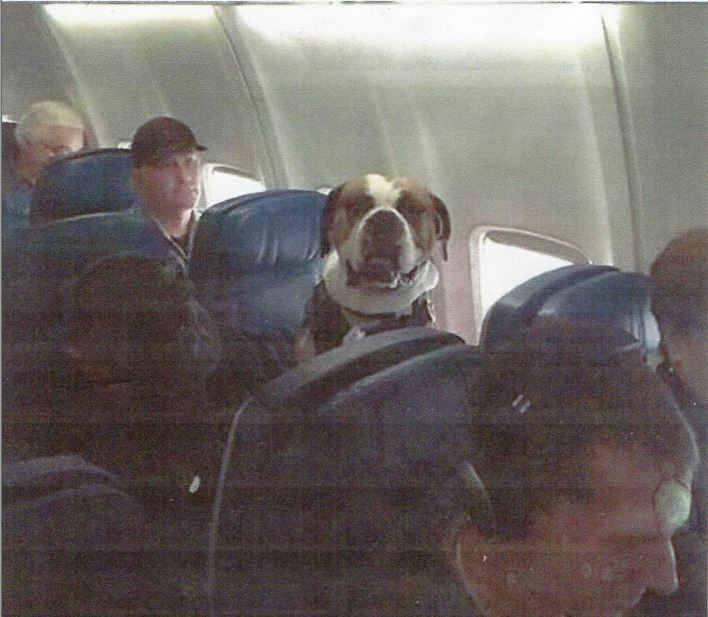 These included white carry-on bag tags identifying items that could be placed under seats, refocusing on checking bag sizes pre-security, as well as testing a trial process for boarding employees on non-revenue leisure travel in Zone 6. The first two initiatives have been very successful. For example, on Montréal -Toronto flights we have seen a 50 per cent decrease in the number of bags checked at the gate and feedback from customers is positive. The success of these initiatives means effective January 15, 2019, we can return to the zones previously used for non-revenue employee travel, although employees are still encouraged to check luggage when possible and to gate-check bags when flights are full and our agents are asking for volunteers. We have an almost three year old granddaughter, Isannah, that we are leaving behind. She is quite used to meeting with her Nana and sometimes her Papa too, at least a couple of times a week. Nana is so worried that Isannah isn’t going to understand that we are going to be away for 3 weeks, so she has devised a plan for that. Isannah loves "Paw Patrol", a kid’s cartoon about a team of Puppies that are out saving and helping the world one small adventure at a time. 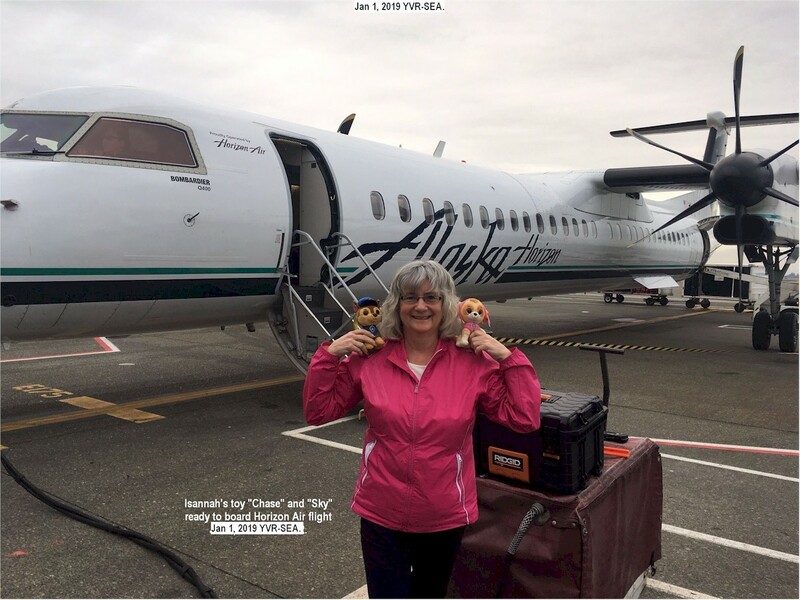 Anyways Nana has packed 2 of Isannah’s favorite stuffies of the 2 main characters of the show, "Chase" and "Sky", and she is going to take pictures of them as we wander along on our adventure. And then we messenger/e-mail them to Isannah, and having her Mother read the story or challenge that’s attached to each picture out to her. 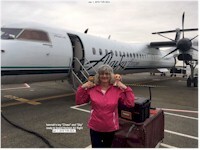 The flight attendant is a Nana too, and she is so tickled with Nana’s plan. 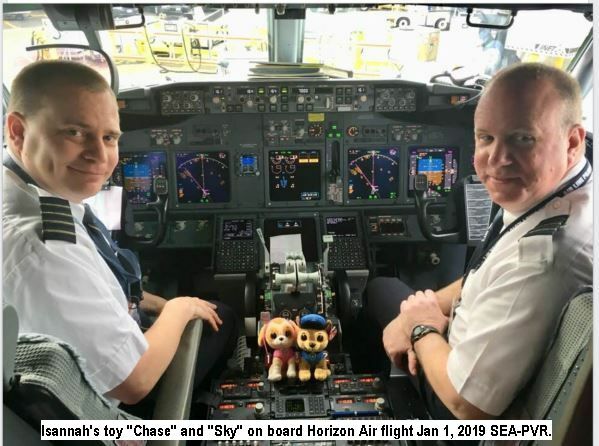 She grabs "Sky" and "Chase" and takes them up to the front of the plane and has the 2 pilots pose for a picture in the cockpit with the stuffies. Nana is so happy and the picture is awesome. Anyways I may mention them once in a while, but if you really want to follow along with the adventures of "Sky" and "Chase", you’ll have to get a hold of Isannah, and I’m sure she would be happy to add you to her ‘blog’ as well, LOL. Just a small selection of the many deals by Dargal. Hong Kong; At Sea; Keelung; At Sea; Busan; At Sea; Incheon (Seoul); At Sea; Tianjin; Tianjin; Tianjin; At Sea; Jeju; At Sea; Shanghai. Sydney; At Sea; At Sea; Lifou; At Sea; Suva; Lautoka; At Sea; Mystery Island; Noumea; At Sea; At Sea; Sydney. From: Inside: $713 Oceanview: $1016 Balcony: $1197 Suite: $1797. Cruises: Rates are quoted in U.S. dollars per person (based on double occupancy). Port charges are included. Taxes & fees are not included. Fuel supplement may be applicable. All rates are subject to change, availability and eligibility. All offers apply to new bookings only, are capacity controlled and may be withdrawn without notice. Valid from January 2, 2019 to April 20, 2019. From $99 AI pppn. Valid from January 5, 2019 to April 30, 2019. From $115 AI pppn. Resorts: Rates are land only, quoted in U.S. dollars per person per night (based on double occupancy). 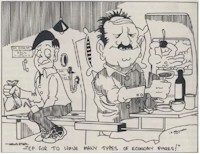 Our cartoon is by D. Fallwell of CPA from the "Blue Skies" magazine issued April 1979. 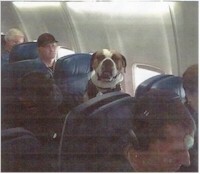 Flight attendant on Delta Airlines posted this photo with the caption: "Only one paying attention to the safety demo".